Cheanu is featured in Personal Money, August issue, page 66. Exclusive interview reveals the secret to passive income with Passive Resources. 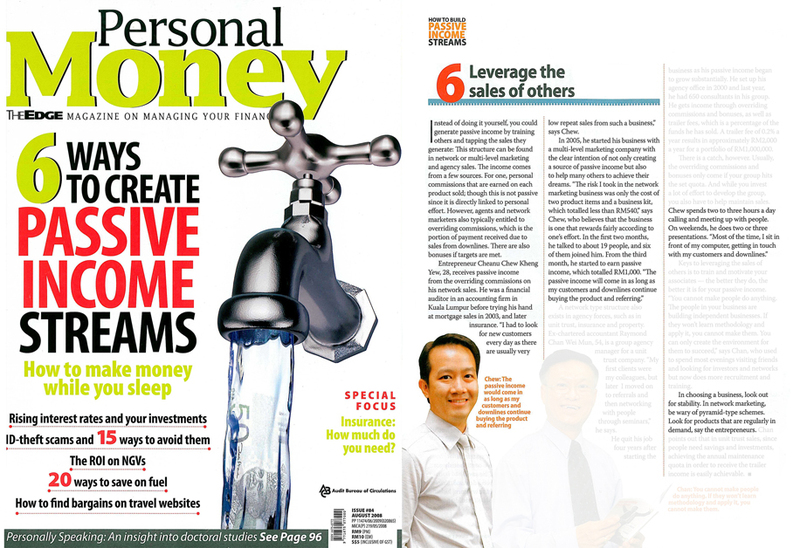 In this most recent issue of Personal Money (The Edge Magazine on Managing Your Finance), editor Celine Tan’s cover feature shows that there are practical ways to build up income streams so that you won’t always have to trade your time for money. This cover story features 6 ways to create Passive Income Streams and how to make money while you sleep. On page 66, it states that the lowest cost of all the 6 ways to start creating and maintaining a passive income stream is the one shown by Cheanu Chew—thru his trademark automated system, Passive Resources. Celine: I’d like to have some introduction about you… How should I address you? And how old are you? And please tell me more about yourself. Cheanu: My name is Cheanu Chew Kheng Yew—my friends address me as Cheanu. I’ll be 28 years ‘young’ this year. I was a financial auditor by profession. During my college years I was awarded The Star Education Fund Scholarship to pursue my ACCA course. I completed my ACCA course and graduated in 3 years. In 2001, I began my first financial auditing career in one of the top accounting firms in KL. The best-selling book “Rich Dad Poor Dad” by Robert Kiyosaki had a very great impact on my perception about my financial destiny—thus creating a turning point in my life. I left the financial auditing industry in 2003 and went on to acquire my skills in the corporate world, mainly in leadership and personal development and eventually pursue my dreams of financial independence. Celine: My article for the August issue would be about generating passive income. It’s our cover story for the month. May I know how long have you been in the passive income-generating tool and how long does it take you to generate passive income? Cheanu: I’ve been involved in network marketing with a clear intention of not only creating a source of passive income for myself, my family and my next generations, but to also help many others to achieve their dreams along the way. I started my own business with 4Life Research in 2005. It took me 3 months to start enjoying some passive income. Since then I’ve never turned back and went forward to create more passive income with 4Life Research. Today, I’m a public speaker, author, business entrepreneur as well as a personal development coach. I’m enjoying every single minute of my day now, working in the comfort of my home. Celine: What is the cost or investment needed before it becomes a passive income-generating tool (in money terms and time)? Cheanu: The amount of time needed to start generating passive income would be very much depending on your own commitment and effort. I’ve seen people generating passive income as soon as 2-3 months from starting their businesses. During this period, the cost in money terms would mainly be your phone charges, transportation costs and some food & beverages expenses as you will be contacting and meeting up with people. Celine: What should they know before they embarked in investing in tools that could provide passive income? Cheanu: Before anyone embarked in starting their own network marketing business, they should do some preliminary researches on the background of the company, the products or services the company is carrying and its marketing plan. Nowadays, information can be easily obtained over the Internet; and because of that, we need to be aware of the source of such information. One more thing that I personally look for besides the company, products and the marketing plan, is the support system. This is particularly important as the key to success in network marketing is the ability to duplicate your work easily. I have founded Platinum Networkers, an international team of profesionnal entrepreneurs dedicated to empowering ordinary people to become inspirational leaders. Our team is well known for its strong duplicable system. It is because of such a strong support system that works both online & offline, that I’m able to enjoy passive income faster and have my business cross over to other parts of the world without having to be physically travelling places. In fact, we’ve developed an automated system that supports our people to enable them to achieve greater height faster and easier. Celine: What are the main sources of income and expense? Cheanu: In the long-run, the main source of income from network marketing doesn’t come from the sales of products or services you’re involved in. Initially, you may earn only from your personal sales before you secured a source of passive income. But there’s only so much you can sell in a day. By duplicating yourself in terms of your skills and leadership, you will be building a network of distributors as well as consumers in your organization. Eventually, the overriding commissions earned from this network will eventually form the main part of your income. The main source of expenses, however, would remain the same as they would mainly be your phone charges, transportation costs and some food & beverages expenses. Celine: How to maximize the best returns? Cheanu: The only way to maximize the best return is hard work. Follow the advices of your successful upline leaders and put into actions what you’ve learned from them. Treat this as your own business, because it is. Never get lazy just because you’re not reporting to anyone and you get to control your working time and the pace of your own progress. If your support system comes with a tool that helps you promote the business automatically, sort out interested prospects and capture their contact details, don’t hesitate to use it. This kind of tool could generate income for you faster than you could personally. Celine: What is the maintenance works needed? Cheanu: As network marketing is well known for its low cost of operation, there’s not much maintenance works needed. Anyone can join a network marketing company and start building the business. Perhaps the only maintenance works needed are self-improvement and personal development. Although anyone can start a network marketing business, not everyone can succeed big time in network marketing. One needs to have a strong personality and mindset, which comes with a right attitude, to achieve great success in network marketing. Most companies and support teams will have their own self-improvement and personal development trainings that you can attend periodically. Celine: What are the risks involved? Cheanu: The risk of venturing into a network marketing business would be the lowest as compared to any types of conventional businesses as we don’t need to pay for rental expenses, salaries, EPF contributions, logistics and product deliveries. The financial risks involved would depend on the network marketing company you venture into. As for me, the risk involved in the network marketing business I’m involved in is only the cost of 2 product items and a business kit, which totaled less than RM540. Some companies require large bulk purchases of their products for you to join. For such companies, the risks involved would be the high financial risks if you fail to build a source of passive income from this venture. One acid test is to determine if the products are “easy to buy but hard to sell”. If they are, then the risk would be higher if a large bulk purchase is required. Celine: How to handle hassles from such work? What are the skills needed? Cheanu: To succeed in network marketing, you need to have very good leadership & people skills, as we’re dealing with people and helping them achieve their dreams in the long-run. However, the beauty of network marketing is that you don’t need to learn everything before you can start building a business that lasts. If your support team is strong and experienced, they will be able to guide you along step-by-step and have you learn the skills while earning at the same time. I personally mentor my people along when they started their business and then coach them personally to identify their strengths and weaknesses so they can learn about themselves and improve themselves progressively. If you join a team who leads with their hearts, then you should be fine. Celine: You mentioned that your team has developed an automated system to support your people. Is there a cost to this? Cheanu: We’ve developed an automated system that runs online for us, and it costs only RM15 per month as cost to the web host. We don’t charge for our support, as we believe in building people by giving them full support to enable them to achieve greater height faster and easier. You can take a look at how it works at Passive Resources. Celine: How to identify opportunities? Cheanu: Opportunities are everywhere, and can only be seen by those who are open-minded and ready to embrace them. Everything has changed nowadays as compared to 30 years ago. If our mindset is still stuck in the 1970’s then we would not be able to identify opportunities that come around in the 2000’s. Network marketing has evolved throughout the past 30 years. Some people still have an old-fashioned mindset and relate network marketing to direct-selling or MLM and that it’s meant for only housewives or people with no education and experience. If you research on the industry itself, you’ll be surprised to find that many leading Fortune 500 companies in the world today are embracing network marketing as a sound business model. Many professionals, like me, are passionately involved in network marketing today. Celine: How to research the market? Cheanu: The best way to research the market is to determine what the fastest growing trend is. The fastest growing trend today is the Internet. But the Internet is just a gigantic marketplace that sells everything under the sun. So we need to identify which product is the highest in demand. According to Paul Zane Pilzer, the health and wellness industry will exceed the one trillion dollar mark within the next few years (Paul Zane Pilzer was the advisor to two past US Presidents and won the Nobel Prize for Economics). As you might know, the baby boomers are those who were born between the year 1946 and 1964. They form 1/3 of our world. Every 18 seconds, someone turns 54 years old. What do they need? They need to look and feel younger, healthier and more vibrant. So the next biggest trend is something that can fill their needs. The health and wellness industry is the next biggest boom. If you could combine the Internet and the health and wellness industry, you’re tapping into the next trillion dollar industry. Celine: How to know if a tool is going to provide passive income? Cheanu: To find out if a network marketing business model is going to provide passive income, do your own calculations according to the marketing plan. If the main source of income comes from selling of products or services or from sponsoring new downlines, then it is not entirely passive. Some companies sell one-off items with very low repeat sales, therefore the distributors need to keep looking for new customers or keep sponsoring new downlines in order to maintain their income. Look for companies that carry consumable products, with repeat orders at least once a month. On the other hand, the product must be unique and effective so that customers will keep repeating their orders without being asked. Besides being unique and effective, one key point to note here is if the company has a worldwide patent for its unique product. If yes, then the passive income source would be almost guaranteed. If the product has a strong science base and an extensive independent researches being done on it, then it should be safe. Celine: How to not fall onto unrealistic promises? Cheanu: Beware of unrealistic claims by over-enthusiastic distributors. Some tend to over-exaggerate their income claims or product claims in order to convince others into joining the business. Do your own due diligence. Research for yourself (but don’t over-analyze) the background of the company, the science behind the products, the marketing plan (if it’s workable) and the support team you will be attached to. Calculate for yourself after understanding how the marketing plan pays, how much earnings you will make based on your expected, realistic effort. Never compare your own progress with others. Everyone will earn at a different level depending on their skills, effort and commitment. Celine: Cheanu, thanks for sharing your experiences and knowledge on this issue. The magazine is out and should be at major newsstands by end of July. Cheanu: Thank you for your time. It is a pleasure meeting up with you today. I deeply enjoyed our conversation. I hope you do as well. For more information on how you can join Cheanu’s team, take a look at www.myunlimitedincome.com and take your free test drive. Everything will be presented to you, with pictures and explanations along the way.